Privacy has been a heated topic in recent months, with everyone now up in arms over unauthorized leaks and exposures. And guess what—tablet and smartphone users are just as vulnerable. Remember, the Google Play Store is unfiltered, so malware can just as easily make its way onto your Android device just like it can your computer. It could be masked as a seemingly harmless puzzle game, a fancy wallpaper, or pretty much anything else you can think of. If you download apps from third-party stores or directly from developers, you can be at greater risk. Last month, Juniper Networks analyzed mobile apps for malicious intentions and found over 260,000 floating around, most of them for Android devices. In fact, 3 out of 5 third-party Android app stores serve up malware. Everyone has seen the Android app permissions screen when installing an app, but if you're like most users, you click install without even reading it. I don't know about you, but that's a lot of permissions for just one app. Next thing you know, Facebook has access to your contacts and you told everyone your location without realizing it. This has to stop. Your privacy matters. Today, I'll show you how to lockdown and secure your app permissions on your Nexus 7 tablet, to make sure your data isn't going somewhere you don't want it to. 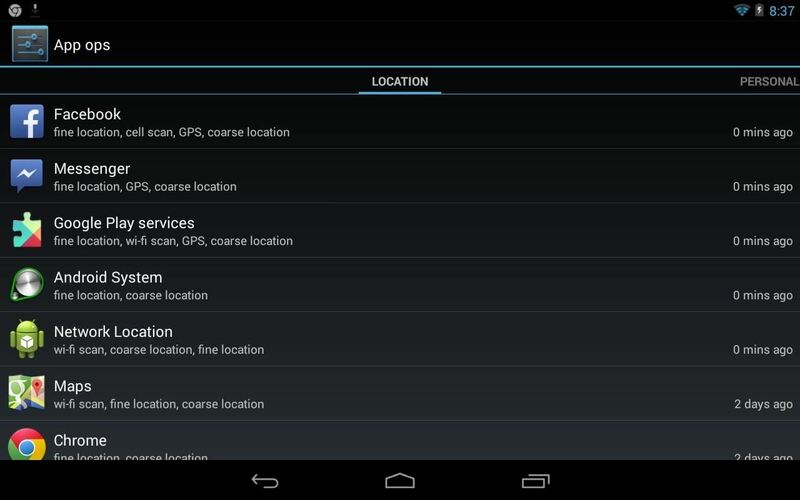 This guide only covers the new Android 4.3 update. If you haven't received Jelly Bean 4.3 on your Nexus 7 yet, you can download it now or wait for the OTA, or you can root and use something like XPrivacy as an alternative means of protecting your data. 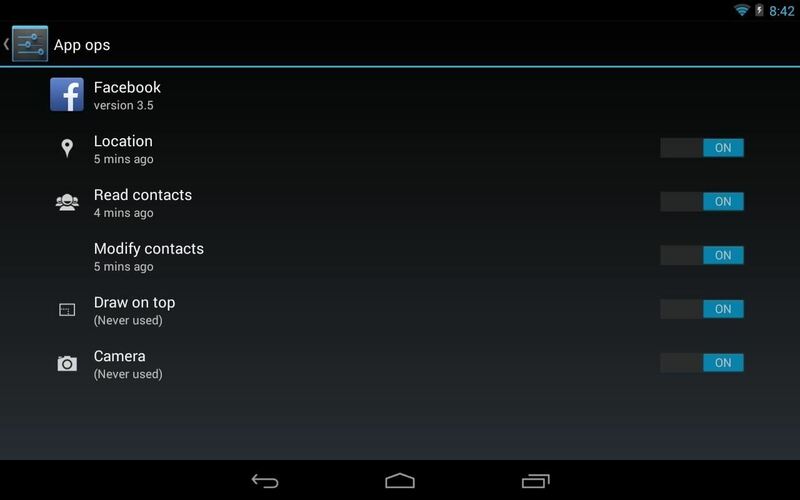 Head over to Google Play and download and install Permission Manager on your Nexus 7 tablet. Update: When this guide was made, Permission Manager was totally free, but as of August 1st, it is now powered by ads. Alternatively, give App Ops Starter a try if you want a truly free app with no ads. Like mentioned above, you'll need to be on Jelly Bean 4.3 for this to work. If you're not on 4.3, wait for the OTA update or visit install the update manually. 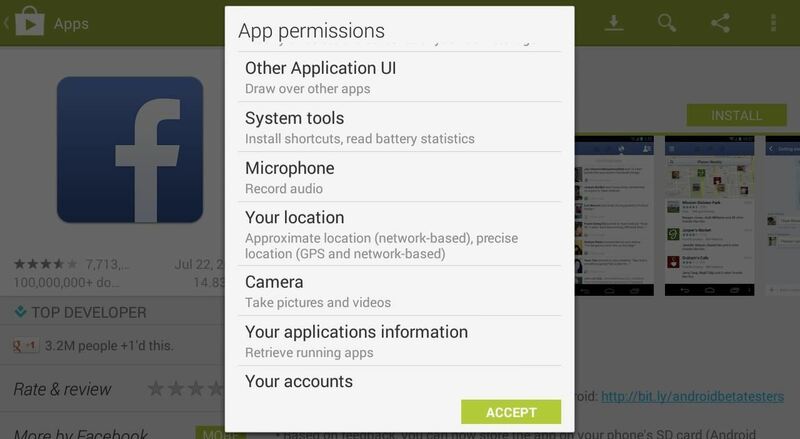 Permission Manager isn't like a normal app, as it's linked to the secret app permissions manager built (called App Ops) into Android 4.3. Since the new App Ops feature in Android 4.3 is hidden, we need to get to it by launching Permission Manager from the app drawer. You can scroll right to filter by apps that use your location, personal data, messaging data, or device data. As an example, I'll be restricting Facebook to my location and contacts (both reading and modifying). I'm actually surprised Facebook had access to my contacts...I honestly never knew. Right now, Facebook has access to everything, so I'll start switching off access with the toggles. From now on, Facebook will be forbidden to access your location and other private data. Do this for any apps that make you worry about your privacy. Just note that some app functionality will stop working when certain permissions are turned off. No access to your photos means no picture uploads. Keep that in mind if you're locking down all access to certain apps. Who says you have to allow permissions when installing apps!?! Firstly this isn't free. The developer puts ads in the app then wants to charge you $. 99 to get rid of them. What is the app really but a short cut to the app ops settings. Why not write a how doing it directly yourself? Shame on you for promoting such an insidious app. Shame on you... shame shame! Seems version 1.0 has ads embedded in the app. Looks like totally free was too good to last. I've included an alternative app in the article that you can try out instead.